Honey is produced by bees from a substance called nectar. Nectar is the slightly sweet, watery substance produced by flowers. Bees need honey to live. Honey is the fuel that powers the hive. It is a great carbohydrate and gives instant energy so that the many different forms of labor in the hive can take place. Nectar is a 12 carbon complex sugar. Nectar in its raw form is hard for the human body to absorb. Honey bees gathering nectar mix it with their saliva, which contains an enzyme called invertase. This mixing of invertase with the nectar causes a chemical transformation, thus breaking down the 12-carbon complex sugar to fructose and glucose simple 6-carbon sugars which are easily absorbed into the human body. Once this mixture has been dehydrated by the bees to less than 20 percent water, it is considered ripened honey. Beekeepers must know what their bees are feeding on and when it blooms. honey stores and become much more docile and able to be worked with. The smoker should be producing rich, dense, cool smoke. Take care not to blow hot smoke, or flames into your hive damaging your bees. While harvesting many hives in one area it is nice to build a smokey fire to retire to during the work. Disturbed bees will leave you alone while you rest in the smoke of that fire. field to simplify work while processing your honey later. No brood juice should ever be allowed to mix with your ripe honey! Knowing when the honey harvest is ready is an art in which you will get more experienced over time. We have found that an inexpensive kilogram scale placed between the hook on the tree limb and our hive is able to tell us what is going on inside the hive. 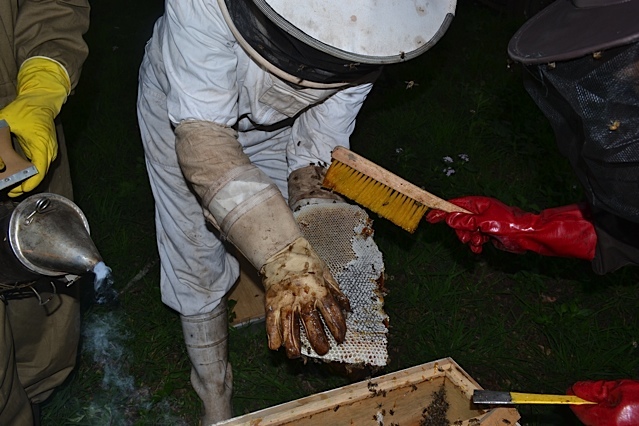 Without having to get suited up, we are able to see how heavy or light the hive is becoming. The heavier the hive, the more honey is in it. If there is rapid weight gain it means that the bees are bringing nectar and changing it to honey. It is a good sign. If the activity at the entrance dies down and the weight gain of your hive stops, it is a sign that you should take your honey. The nectar flow is probably over. This technique works especially well if you are weighing one hive on the scale and have other hives in that area. Whatever is going on in that one hive is probably also going on in the other hives as well, since all the bees in that area will be using the same nectar source. You can also tell what is going on just by watching the outside of your hive. If there is tremendous activity, 10-15 bees continually coming and going throughout the day, there is a nectar flow. If the activity slows down, the flow has stopped. It is probably a good time to open your hive to see what kind of stores there are inside. Aggression on behalf of African bees is another good indicator of honey stores being present. The more volatile the bees are, the more of a chance of honey stores being present. Occasionally, if downwind, you will be able to smell the honey. The bottom line is when in doubt, suit-up and feel the weight of the hive. If it is cumbersome and heavy it has honey. This hive is hanging from a kilogram scale. During a heavy nectar flow it can gain close to a kilogram a day. A hive this size will weigh 41 kilograms when both the brood chamber and single super is full of honey. James starting up a locally made smoker purchased in Sumbawanga. Local craftsmen can be taught how to make hives, smokers, suits and hive tools creating a new source of income for them as well. To harvest honey you need the right clothes, smoker, fuel for the smoker, 2 buckets with lids, small strong table, and a few inexpensive tools. It is also advisable to have two or more companions with you for easier harvesting. It is next to impossible to harvest honey from African bees by yourself! In our opinion, a good smoker is the most valuable tool you can have. It should produce good steady supplies of white smoke. Your smoke chamber should hold large quantities of fuel. It is advised that it be large. A good size is 4” x 10”. The best fuel for the smoker is a topic of debate among beekeepers. We advise the block plane shavings from hardwood boards as they light easily and produce a rich smoke. Untreated sisal, burlap is also good, as are dry pine needles if you have them. The latter will produce pitch with its smoke that will gunk up your smoker if used too often. You should have coveralls or a bee suit complete with a veil. Long gloves are also necessary. We advise wearing a canvas shirt or sweatshirt under the suit for added protection. High rubber boots are also nice for tucking in the bottom of your coveralls. Use a small strongly supported table to put on the ground as a base to rest your hives on while working them. It is easier on your back and keeps your hives out of the grass. In terms of tools you should have a long knife, bee brush, and a sharpened hive tool, or long screwdriver if no hive tool is available, rope to lower your hanging hives, and a metal or wooden ladder to reach higher hives. Two buckets should be used, one for first-grade and the other for second-grade honey. First-grade is the capped ripened honey and second-grade is the partially capped honeycomb mixed with brood and pollen. Stewadi is wearing the proper protective clothing for working with African bees. It is always good to wear a thick shirt under your suit and to be sure all gaps are closed to avoid bees entering. Bees inside your suit make the whole process of harvesting harder for you as well as your partners who are counting on your assistance. 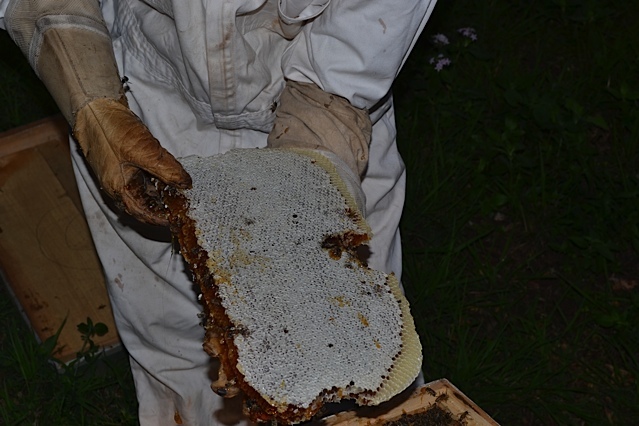 The last comb in a top bar hive is almost always an uncapped comb containing nectar (not ripened honey). Replace this comb back in the hive after harvesting your ripened capped honey comb. Tanzanian beekeepers with guests harvesting from a top bar hive. As beekeepers harvest their honey they are careful NOT to allow too much smoke to affect the quality of their honey. Only by practicing will African beekeepers learn how much smoke is needed to calm the bees without adversely affecting the quality of the honey. After the hive is opened the person working the smoker can stand upwind and let gentle smoke drift over the people doing the harvesting. This will calm the bees without allowing too much smoke. Honey is hygroscopic and will readily absorb flavors and smells in its vicinity. Always store honey in a shaded area away from strong smelling substances and high humidity. Well capped honeycomb of ripened honey. This is a nice example of what all top bar honey combs should look like at harvest time. Honey in comb like this is almost always less than 20 percent water and 80+ percent (sugar) glucose and fructose. That means it will not ferment or go bad. If there are no wax cappings on your comb, you run the risk of fermentation due to high water content in your honey. The bees won’t cap it until they have dehydrated it properly. This is a good example of “dry cappings.” These wax capped honey cells have a small space of air the bees have left between the honey and the wax caps. It is a genetic trait of different colonies to make either dry cappings or wet cappings. Take your time as you prepare. The wise beekeeper is sure that all his equipment is ready before lowering his first hive. Dress well, have one of your companions check to be sure your suit covers everywhere and that there are no holes for bees to march in. Light your smoker before putting on your gloves. Have all your fuel ready for the smoker, as you do not want it going out on you. Position your table 10-20 meters away from the hive you will be working as you do not want the foragers coming back and finding you at the site where the hive was hanging. Put your buckets next to the table. Be sure your bee brush and tools are handy. Position your ladder if the hive is in a tree, climb the ladder and blow smoke into the entrance of your hive. Be sure a fair amount of cool white smoke goes into the entrance. Attach your rope to the hive. Smoke your hive this way for a minute. Do not work your smoker too hard as you may be blowing fire into your hive. Be careful to not over-smoke the honey. Honey that is over-smoked will have a disagreeable taste and will not sell well. *It is advisable to have a clip of some sort on the end of your rope so it is easy to remove from the hive. It is impossible to untie a rope with honey-drenched gloves on your hands. Wait 3-4 minutes before lowering this hive. The smoke will cause the bees to instinctually gorge themselves on honey, making them less aggressive and more docile. Have your companions carry the hive to your table, which you have positioned 30-40 meters from where your hive was hanging. Foraging bees will return and gather on the branch. If you try to work your hive near the site where it was hanging these foragers who have not been “smoked” will attack you. You will know if your hive has lots of honey by its weight. If it is extremely heavy you have done well! A bucket of honey can weigh 60lbs or 27kg! Log hives are notoriously hard to smoke. Do your best at getting smoke into every crack and entryway on the outside of the hive. Lower the hive and have your companions place it on the table 10-20 meters away from the site where the hive was hanging. Open it up, smoking around all the while. Once opened all the contents must be removed. Therefore, you will need an extra large bucket for the brood comb found in the hive. Separate your honey as grade one and grade two as you harvest. It is hard to do afterwards. Leave the bare hive on the ground where you took it down from the tree for the bees to clean excess honey. Come back later at night to retrieve it and prepare it to hang again for a new occupation of honeybees. Consolidate your brood comb from all of your log hives to render the processed squeezed honeycomb into wax. Here is an easy way to render wax for baiting of next year’s hives or sale by the beekeeper himself. In cities in Africa, beeswax sells for about 4-5 dollars a kilogram. Depending on the size of the log hive harvested, several kilograms of wax are available from each hive. While your companions transport a Top Bar hive to the table to work it, be especially gentle as these hives have no supported, wired frames in them to protect your honeycomb. Once on the table remove the cover of the hive and tap gently on the top of the bars with your hive tool. You should be able to determine how far back the honeycomb is located within the hive by the sound of your tapping. Once you have determined where the comb is, remove the bar behind the last comb. Slowly remove one comb at a time, harvesting those combs that have ripened honey on them. Brush the bees from each comb harvested before cutting the comb from the bar. Leave ½ inch of comb on the bar for the bees to reattach new comb. Ripened honey will be capped and heavy. Be careful as you do this; these combs can break off easily. Be sure all bars are returned to your hive and return it to its site. Notice how this beekeeper before cutting his honeycomb from his Top Bar has cleaned the comb of bees. When a beekeeper takes honeycomb from his hive it can have hundreds of bees on it. These need to be brushed off before the beekeeper puts the honey in his harvesting bucket. If he doesn't do this he will be hurting his colony and carrying many bees unnecessarily home with him. Frenki bangs the honey super from his Langstroth on the brood chamber underneath before taking it for processing. It will need to be cleaned further of bees but this will remove the bulk of the bees clinging to the honeycomb. Note: Langstroths are the only type of hive that you can do this with. It's frames with reinforced wire make the comb strong enough. If you have a Langstroth hive, remove the honey super from the hive and bang it up and down on the inverted top of the hive thus removing many of the bees hanging on the comb in the super. Place the super in your vehicle or a plastic bag for transporting back to your home. Dump the bees from the inverted top back in your hive. Re-super the hive and return it to the tree it was hanging on. Note: It is important to smoke the site on the branch of the tree that your hive was hanging. There will be thousands of bees hanging from the branch waiting for the return of their “home.” If you do not smoke them to remove them from the branch, by pulling the rope to raise the hive you may kill hundreds clinging to the branch. This hurts your colony and causes large amounts of alarm Pheromone to be released, inciting anger in all the bees in that area.